My husband and I recently returned from a photo safari in Kenya and Tanzania. It’s been a decade since I was in East Africa. In 1998, I enjoyed one of the most exhilarating and empowering experiences of my life; I climbed the world’s tallest freestanding mountain, Kilimanjaro. This trip, however, was quite different. We spent most of our time driving in national parks and looking at the abundant wildlife. The game viewing was tremendous. Now that I am home, I keep thinking about what we saw outside of the national parks. Every village had an orphanage…or two or three. Many children have lost their parents to AIDS, alcoholism, or a combination of the two. Our driver explained that some people just feel hopeless about their future, and they don’t think twice about engaging in reckless behavior, despite the potentially fatal consequences. I don’t know if the situation has deteriorated in the last decade or if I saw it differently now that I am a parent, but the challenges they face are beyond my comprehension. I set up this blog back in February and had every intention of launching it right away with regular postings. Work, however, got in the way. My team and I have been busy – very busy – marketing and selling homes. Contrary to the blanket reports of doom and gloom from the media, there are bright spots in the market. I don’t deny that there are parts of this country where real estate values have fallen dramatically and foreclosure rates have skyrocketed, but Chicago is not one of those markets. 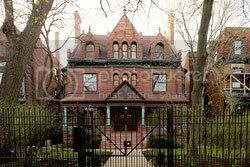 Welcome to my blog, Live and Play in Chicago. My name is Jennifer Ames, and I am a top-selling residential real estate agent in Chicago as well as a lifelong Chicagoan. My family has been an integral part of this city for more than 150 years, and suffice it to say, Chicago is in my blood. The fourteen years I’ve spent in Chicago real estate, as well as the ongoing experience of raising three children in the city, has granted me a uniquely intimate perspective on this town. Because of this, I feel that I have much to share, and I have chosen this blog as the venue. Chicago is one of the world’s great cities. There’s something for everyone here, and it’s my goal with this blog to share not only my insights into Chicago’s real estate market, but also on making the most of living, playing and raising a family in the Windy City. Like any blog, this one is likely to evolve as it progresses, and I’m excited to see what direction it will take. As time goes on, I hope more and more of you will join me with your readership and your comments, but in the meantime, enjoy!